Athletes from Ethiopia won four of the six medals in the 13th Vodafone Istanbul Half Marathon that was held in Turkey’s largest city on April 8. Walelegn Amdework, a 19-year-old Ethiopian, won the men’s 21K race in 59 minutes and 50 seconds, breaking the record. Tefera Asefa, a 25-year-old and also Ethiopian, followed him with 60 minutes and 7 seconds. Turkish athlete Kaan Kigen Özbilen finished third, being only a second slower than Asefa. In the women’s race, Ethiopian Ababel Yeshaneh won the gold medal in a time of 1:06:22, while her fellow citizen Roza Dereje got the silver medal with 1:07:00. Kenyan athlete Diana Chemtai Kipyokei was third in 1:07:55. The winners were given the medals in a ceremony by Istanbul Metropolitan Municipality Mayor Mevlüt Uysal and Turkish Athletics Federation head Fatih Çintimar. More than 8,000 athletes, of whom 42 are elite, attended the races. 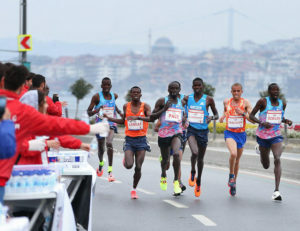 They ran in the coastal course between the quarter of Sirkeci and Zeytinburnu port. In 2017, the Istanbul Half Marathon was promoted to the Gold Label status by the International Association of Athletics Federations, which designates leading road races around the world.